Home / FILM POSTERS / MOVIE TRAILERS AND INFO / Thomas Jane and Laurence Fishburne in Edge-of-your-seat thriller "Standoff"
Thomas Jane and Laurence Fishburne in Edge-of-your-seat thriller "Standoff"
“Standoff” pits Carter (Jane), a troubled veteran against a deadly assassin named Sade (Fishburne) trying to kill a 12 year-old girl after she witnesses a murder. 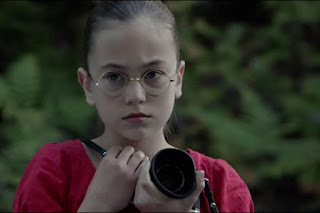 Bird, played by Ella Ballentine, is the 12-year-old girl coming to grips with the loss of her own parents. One day while in the cemetery, she witnesses a brutal murder and captures photos of the event on her camera, and attempts to flee with her guardian. But the ruthless Sade kills her guardian and then turns his attention to Bird. Bird runs toward Carter’s house for help. Concerned, Carter runs to her rescue, but is shot by Sade from a distance. The two victims dash inside and up to the second floor. Armed with a single-barrel shotgun, Carter shoots Sade from the top of the stairs as he enters the living room. Both men assess their wounds and their firepower, and Carter realizes that he has only one shell left. A narrow staircase and a thick wardrobe prevent the men from taking a clear shot, so a game of psychological manipulation ensues. 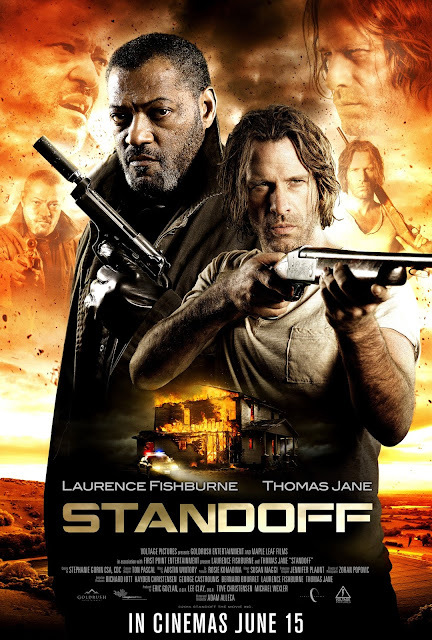 “Standoff” opens June 15 in cinemas to be released by OctoArts Films International.